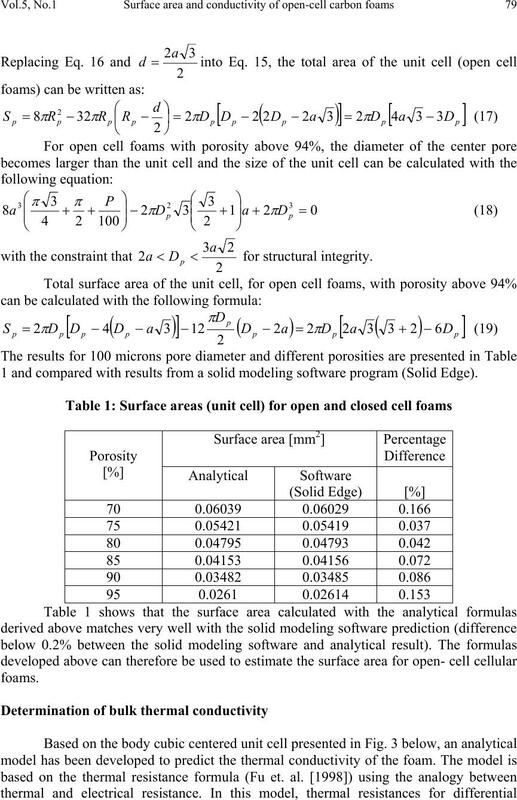 empirical models, FEM solution and other analytical solutions. 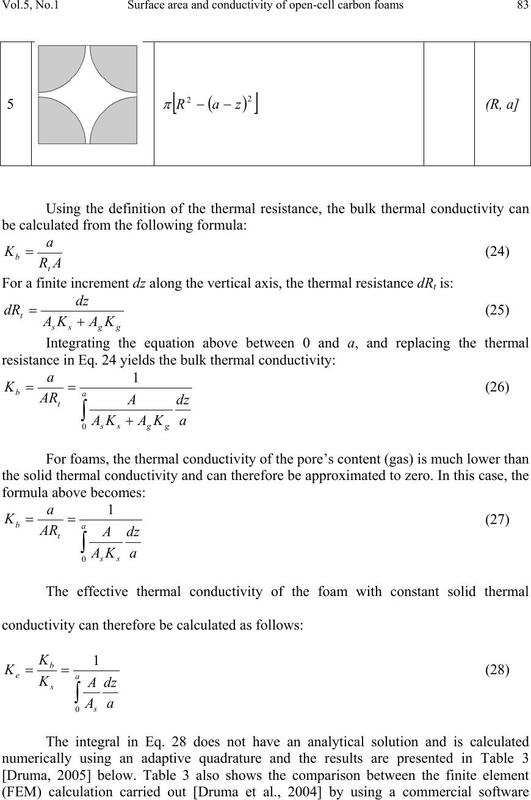 Ris the thermal resistance of the foam [°C/W]. ϕ Fraction defined in Eq. 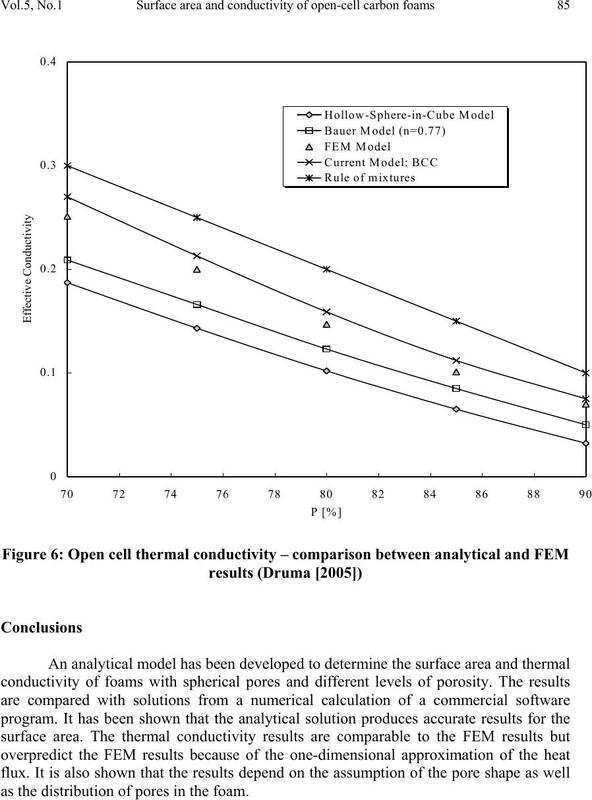 6.
thermal conductivity of packed beds. the porosity and the ratio of the cross-sections of the fiber and the intersection. ligaments used in heat exchanger applications. compared to the results given by a commercial solid modeling software package. 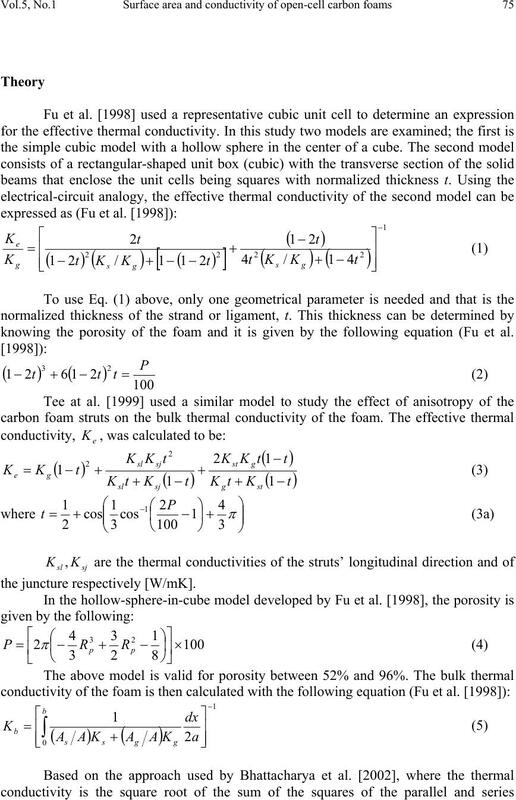 knowing the porosity of the foam and it is given by the following equation (Fu et al. 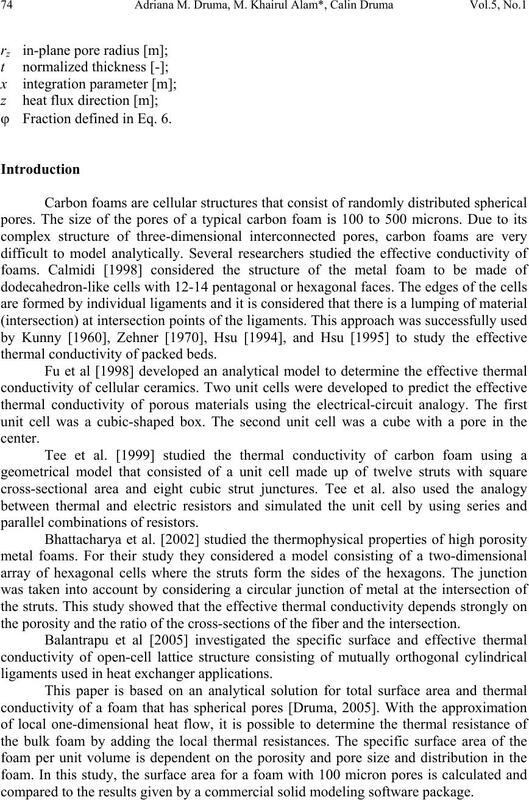 for conduction through the cell walls. structure built of straight beams that has been used by Tee et al. .
is the distance between the two spheres (half diagonal of the unit cell). 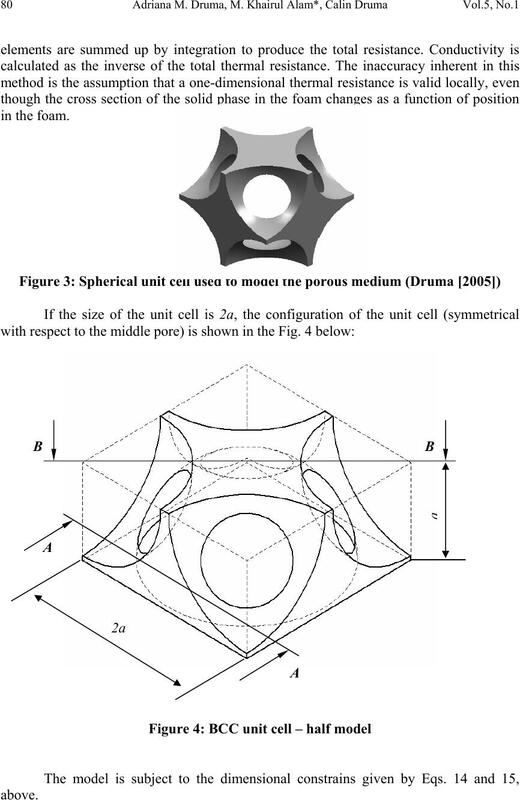 −=” (Druma ) as shown in Fig. 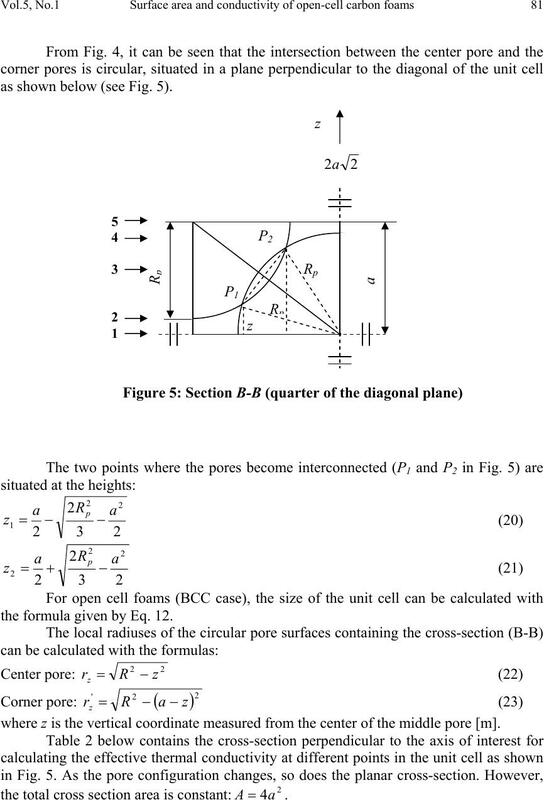 2.
geometrical constrain given by Eq. 13. 1 and compared with results from a solid modeling software program (Solid Edge). as shown below (see Fig. 5). 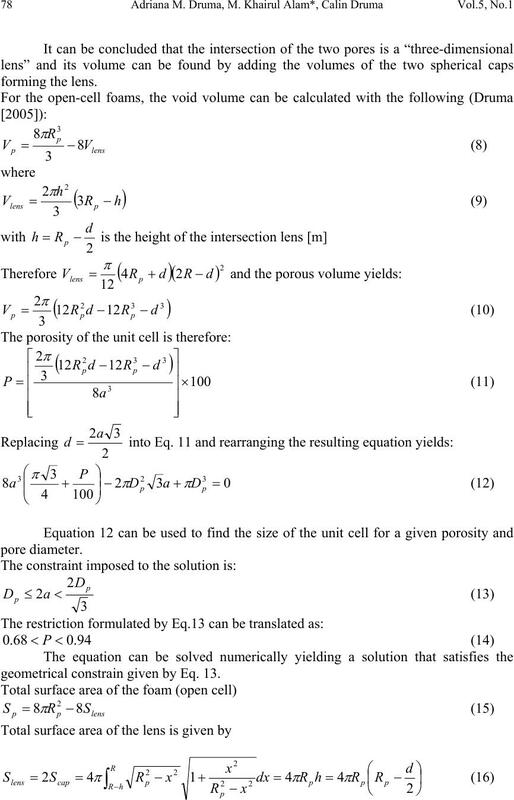 the formula given by Eq. 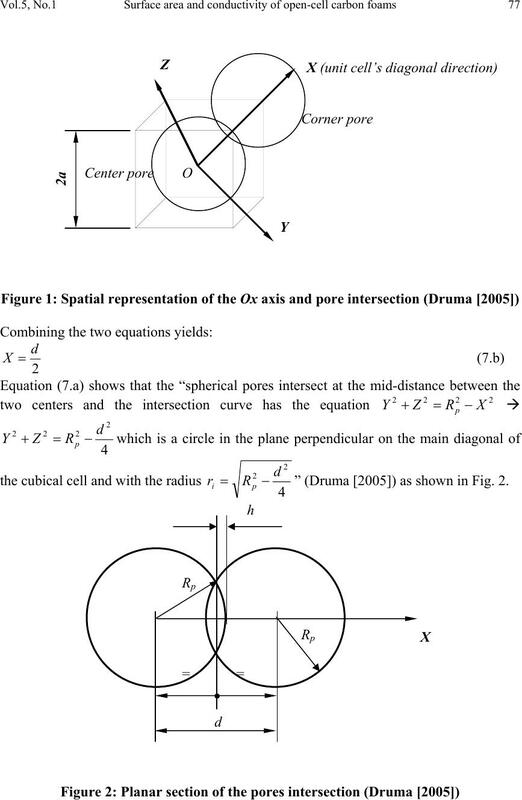 12.
where z is the vertical coordinate measured from the center of the middle pore [m]. the total cross section area is constant:. 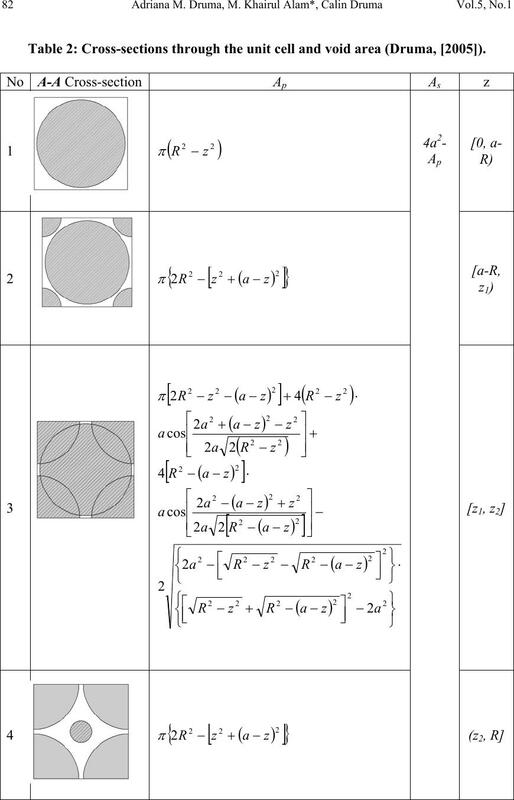 Table 2: Cross-sections through the unit cell and void area (Druma, ). 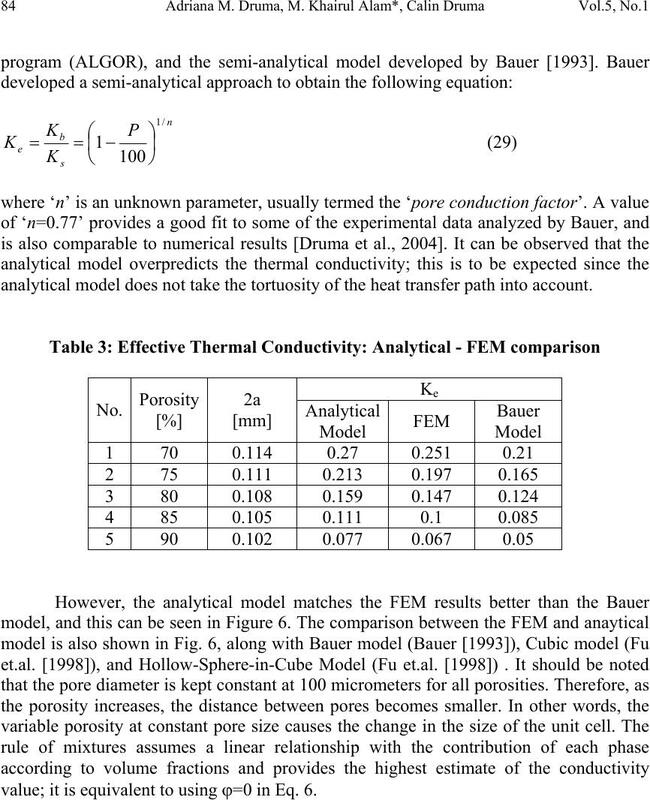 analytical model does not take the tortuosity of the heat transfer path into account. value; it is equivalent to using ϕ=0 in Eq. 6.
as the distribution of pores in the foam. Proceedings of IPACK2005, IPACK2005-73191, California, 2005.
media”, Int. 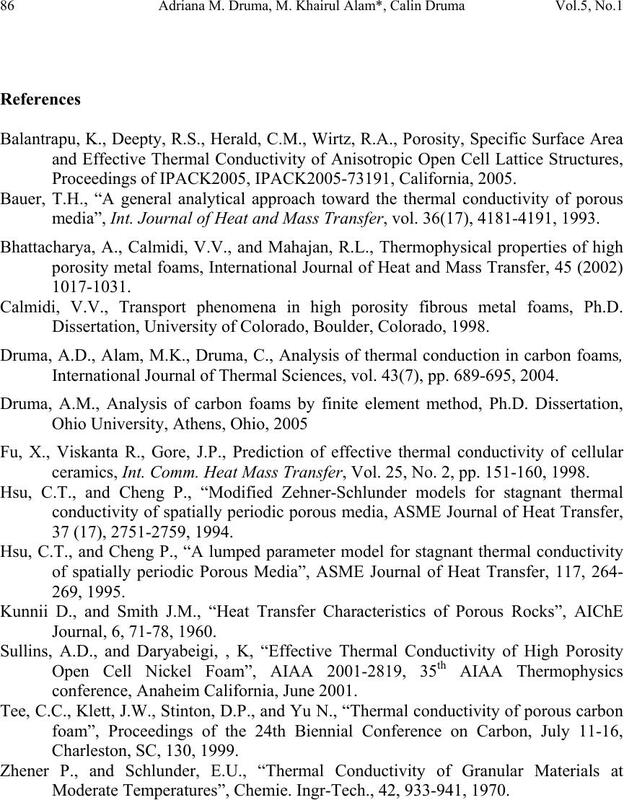 Journal of Heat and Mass Transfer, vol. 36(17), 4181-4191, 1993. 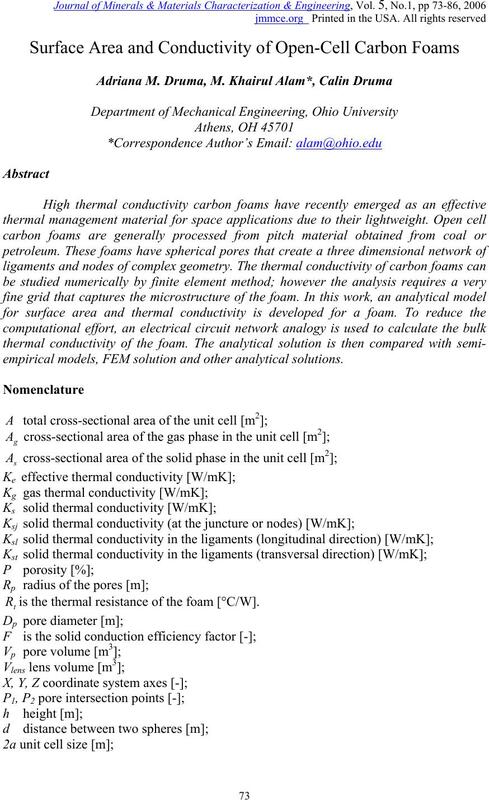 Calmidi, V.V., Transport phenomena in high porosity fibrous metal foams, Ph.D.
Dissertation, University of Colorado, Boulder, Colorado, 1998.
International Journal of Thermal Sciences, vol. 43(7), pp. 689-695, 2004.
ceramics, Int. Comm. 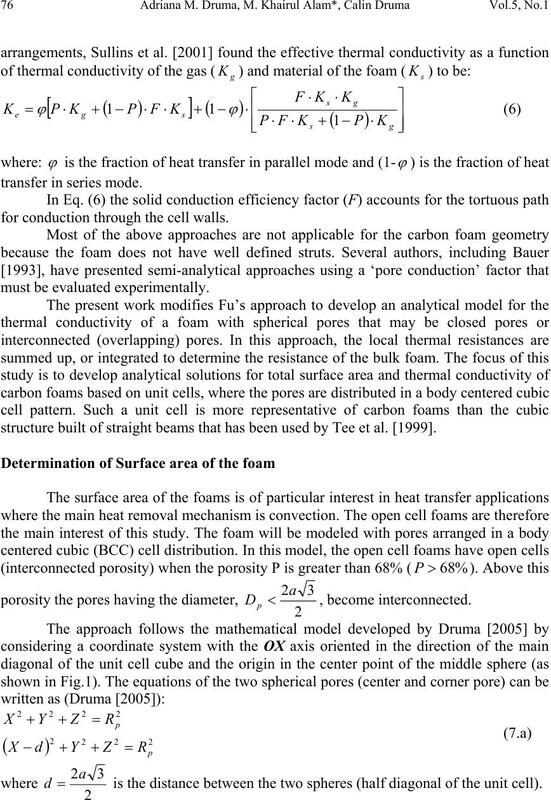 Heat Mass Transfer, Vol. 25, No. 2, pp. 151-160, 1998.
conference, Anaheim California, June 2001. Moderate Temperatures”, Chemie. Ingr-Tech., 42, 933-941, 1970.